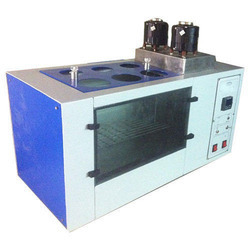 Manufacturer of a wide range of products which include constant temperature bath. We have developed Constant Temperature Bath to be adequately used for temperature sensors calibrations and general laboratory testing. Furthermore, it consists of stainless steel interior and epoxy coated mild steel exterior having working space 300 mm temp. the temperature range is ambient + 5°c to 80°c and is controlled by solid state electronic temp. We developed these products completely as per the detailed instructions of our esteemed clients’ and we offer them at industry leading prices. Sheets and outer made of mild steel sheets duly finished in powder coating. Glass Window provided on the front side for an easy inside view. Inner space in between the walls tightly packed with special grade glass wool.